Wading boots are every bit as crucial as your fly rod. They require painstaking R&D (plus testing), they are composed of numerous materials, and they are manipulated by as many pairs of hands as the average fly rod, yet they rarely get the attention they deserve. After all, a well-crafted boot goes unnoticed, whereas an inferior boot demands constant attention – easily messing up your day on the water. I recently tested SIMMS’s Headwaters Pro Boot (12mm felt sole) and knew something was up right out of the box. These boots are light. I weighed them and discovered that SIMMS shaved a full 100 grams off of their previous generation boot (note: that’s 100 grams – or nearly four ounces – off of each boot). The weight savings are in part due to materials developments. I spent several long days testing these boots and they are truly designed and crafted to reduce foot and leg fatigue… your entire body will be thankful. The nylon upper has been upgraded to an extra-tough and classically stylish waterproof Nubuck. Scratch rubber and a high denier nylon upper surround the exterior perimeter, resulting in an abrasion resistant, long-lasting product. Felt models are fitted with SIMMS’s patented CleanStream materials, which are resistant to hitchhiking organisms. The other version is fitted with Vibram Hydrogrip dual-rubber soles that feature a cleat/stud retention plate. They can be modified quickly and easily. A traditional lace up system (hardware includes metal speed hooks) means unlimited tension possibilities and a dual-density mid-sole offer excellent underwater feel and shock absorption. 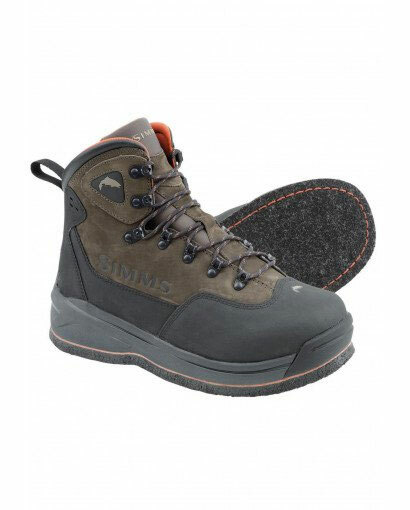 SIMMS buried a nylon shank into the midsole for torsional rigidity, yet the boot offers a good level of flex at the forefoot. One characteristic that I found particularly noteworthy is that the overall design limits line-snares. The Headwaters Pro boot design and materials combine to produce a very comfortable, stable and well balanced boot. They’re perfect for short or long fishing days.